Atmos RX is a leader of innovative vape technology and design, releasing the smallest and most portable models on the market. Atmos uses in-house engineering with attention to detail, in order to design only the highest quality, best products. By holding themselves and their products to the highest standards in quality control, Atmos Magna have become the most widely recognized model of vaporizer kits on the international level, known for their unique and innovative product design. If you are looking for the the freedom to try different materials in a wide range of consistencies. Sadly, most wax vaporizers are built towards a limited number of concentrates, but Magma is AtmosRx's solution to this problem, and is designed for you to vape what you want the way you want. When compared to other best wax pens in its class, the new Atmos Magna offers just as much, if not more, for half the price. The Magna includes a single quartz atomizer and a dual quartz rod atomizer, both of which feature quality titanium coils. Plus the Magna wax pen is equipped with a temperature control battery which offers 3 optimized heat settings. 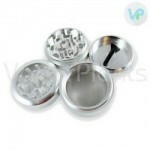 It also comes with a magnetic chamber cover, to give you easy access to the atomizer every time, allowing for super quick and effortless re-loading. As mentioned before, the Atmos Magma is a vape pen that's ready for all types of concentrates. With this wax pen, you'll receive two different atomizers: a dual quartz titanium and a single quartz titanium. You'll have the freedom to load any type of concentrate you desire into any of the chambers with the included packing tool. A magnetic chamber cover gives you quick access when it comes time to load and change the coils, ensuring that the unit stays closed when you're on the go. With the Atmos Rx Magma, you can get the most out of your material. Its glass mouthpiece keeps your vapor pure and flavorful with no contamination from plastic or rubber. The 650mAh battery features a temperature control system with three levels of heating, so you can customize your vaping experience to suit whatever you're vaping. Changing the temperature is as easy as holding down the button. Compact and convenient, the Atmos Magma comes with everything you need to get started. Everything can be stored inside the included leather carrying case for convenience at home and on the go. Love it so much that I'm going to buy another! Discreet and convenient - Review by Allison A.
I got the Atmos Magna for Christmas this year and I love it. I have stopped using all of my other vapes. It is so discreet and convenient to use. I like how sleek and stylish it is, too. It not only is beautiful but it works amazingly as well. I don't think it is hard to clean. It tastes great and has no smell that lingers. The replacement parts do seem sort of cheap, though, and I am wondering how long it will take until I need to get a new chamber. Anyway, my first impression was great and it is still great to this day. Sleek - Review by Bonny M.
I was so happy with the Atmos Magna. The vape is everything I hoped it would be and more. It is not too big and I can easily put it in my pocket. I like to take it with me everywhere I go and I am able to do that because the smell remains nice and low. I also enjoy how sleek it is and how it feels in my hands. Overall, I could not be happier with the Atmos. I will never use my normal dab rig ever again. Excellent battery life - Review by Michael E.
The Atmos Magna is my new favorite way to dab. I love how convenient it is to use and I can load up and use it any time, anywhere without dealing with a bunch of extra unnecessary stuff. I love how big the chamber is because it makes it easy for me to take it with me on the go without bringing along all of my material. The battery life is also excellent. This is just overall a really great vape. Outstanding - Review by Elizabeth S.
The chamber is huge and the battery life is outstanding. I have never been let down by the Atmos Magna when I take it with me. 10 out 10 vape - Review by Abel A. Everywhere I go, the Atmos Magna comes with me. It can go for hours at a time with its battery life and is easy to fill and use. Great value - Review by Robert P.
I can't believe I waited this long to use the Atmos Magna. It is a great value for the money and delivers really great vapor quality; I actually get little clouds from it. Easy to use - Review by Bruce M.
The Atmos Magna is so easy to use and has such a long battery life that I am able to vape with it absolutely anywhere. I love how many color options there are and how cheap it was to buy. Recommended - Review by Dabs G.
The Atmos Magna looks as great as it vapes. I recommend it to everyone who is considering getting one. Discreet - Review by Jim S.
The Atmos Magna heats up in no time at all and is always ready to go when I am. It is a little wider in size than other vape pens but it is still discreet and doesn't turn any heads in public. Glass mouthpiece - Review by Kevin M.
The glass mouthpiece of the Atmos Magna really makes all of the difference in the world in terms of flavor. I love the taste and the really light smell that the Atmos Magna produces. Adjustable airflow - Review by Richard C.
The adjustable airflow on the Atmos Forge is excellent. It lets me choose how I hit it so that all my hits are just how I like it. It is crafted well and super durable. It charges up in no time at all so it is always ready for me to use. Simple to clean - Review by Paul E.
Forge is simple to clean and maintain and I have no problems to report. Forge is fun - Review by Minnie J. The best way to describe the Atmos Forge is to call it fun because it is. It works great for the price and I don't have any complaints about it at all. Great vape - Review by Joshua J. The Atmos Magna is a great vape for those who prefer a combination of both great taste and great cloud production, both of which I have found difficult to get my hands on with a wax vape. Huge clouds - Review by Juan J. The Atmos Forge offers a huge amount of clouds that I haven’t been able to get with any other pens. New favorite - Review by Patrice P.
I think Magna vape is my new favorite vaporizer and I don't see myself using another. Loving my new Atmos Forge - Review by Antonio E.
I am really loving my new Atmos Forge and I think it is becoming my favorite vaporizer. This vape is really sleek and slender and is excellent for any beginner or advanced user alike. Best vape pen - Review by Luis H.
Atmos Forge is definitely the best pen that I have ever tried and I've tried many. I like the rods and it is sturdy, meaning I can get good vapor no matter where I take it. The flavor is incredible without giving off too much of a scent and giving me away. Great dual and single coil atomizers - Review by Lexie J.
I love both the dual and single coil atomizers in the Atmos Magna. The dual coil is great for when I want really great clouds while I prefer the single coil if I just want good flavor. The quartz rods in these coils are really great as well. Perfect little vape - Review by Scott H.
Magna is the perfect little vape for taking on the go and is super convenient for me to use. Long-lasting battery - Review by Derek J. The Atmos Forge has a nice long-lasting battery and big coils that make for a great combination. The vapor quality is excellent and super smooth. I like that the draw resistance is nice and low and doesn't hurt my throat when I hit it at all. Great vaporizer - Review by Philip R.
The Atmos Magna is a truly great vaporizer that is sleek and simple to take with me on the go. Its long battery life, ease of use, great flavor and minimal smell really sold me on the Atmos Magna and made me wonder why I'd never tried it before. Looks beautiful - Review by Linda T.
It looks beautiful and works just as well. I love the dual quartz titanium coil as it gives me the best flavor that I have ever gotten while I am vaping. Compact little vaporizer - Review by Angela E.
The Atmos Forge is a really compact little vaporizer that is perfect to take with me out of the house which is something that I was looking for but couldn't find. This vaporizer is my new favorite wax vape and I love the long battery life on the Atmos Forge. New to go vape - Review by Pearl B. The Atmos Magna is my new go to all day vape. This vaporizer makes me prefer concentrates over herbs again as all of the herb vaporizers I once had were better than a wax vape. That is not the case ever since I started using the Atmos Magna. Good clouds - Review by Jamie D.
I never thought I would be able to get really good clouds with a concentrates vape, but the Atmos Forge proved me wrong. I love this vape and it's incredibly fun. The price is perfect and I couldn’t ask for anything more when it comes to a vape for concentrates. Simple sessions - Review by Curtis C.
The Atmos Magna is awesome and the chamber connector makes it simple to keep an eye on the material inside so that I know when it is time to refill it. The ability to use different settings is great for me to customize my sessions depending on the kind of vapor that I want and the material I am using. Low smell - Review by Elizabeth W.
The flavor is great, but the smell is low. Fast charge - Review by Jo S.
The Atmos Forge has a battery that just seems to stay on forever. When I do need to charge it, it only takes a little while before it is back up to speed. I make sure that I always have this vape on me no matter where I go. Magna glass mouthpiece - Review by June C.
The Magna glass mouthpiece and the chamber make all of the difference in the world for me. Huge battery life - Review by Deloris E.
I love the Atmos Forge and all of the power that is found inside of this smooth little vape. It has a huge battery life and really great flavor which is important in a concentrates vape. I will never go back to using another vape after trying the Atmos Forge. Good battery life - Review by Lillie D.
The Atmos Magna is an awesome kit. It has a good battery life and charges pretty swiftly. It works great with both wax and oils which is important to me. I love the magnetic piece because it makes it simpler for me to fill up, making the experience even better. Flexible - Review by Marcia Z. It is so flexible with what it can do and I get the right vape every single time I use it. It is fun and easy to use in a social setting. Favorite vape - Review by Nikita S.
I have only just started using the Atmos Magna but it is already my new favorite. Really great vapor - Review by Vera J. The coils on the Atmos Forge are great and they make it simple to get really great vapor out of them. Refill it but once a day - Review by Shelia E.
So far so good with the Atmos Forge. I started out with cartridge based vaporizers and was reluctant to try another style until a friend recommended this one to me. I liked it a lot. I like that the atomizer is a really big and I can put in a lot... so much that I don't have to refill it but once a day. Atmos Forge is a great vaporizer for when you are traveling or in public, as it is very light and compact. Works as needed with wax and makes the concentrates last. Simplicity is the key - Review by Scott K.
Great little device for wax, this is my to go vape for all concentrated waxy oils. Simple to turn on, load and use, awesome little vape pen. I’m surprised this isn't more expensive. You get nice quality clouds plus it heats up uber fast, I’m very happy I bought this one. I use it around the house as well, especially if I happen to be in the garden.